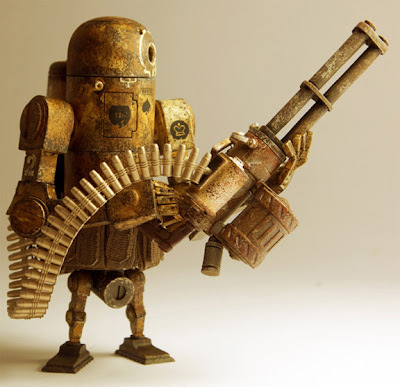 We are very excited to announce a further expansion of our lineup of ThreeA Ashley Wood figures with the pending arrival of the MK2 Bertie 6.5" figures. 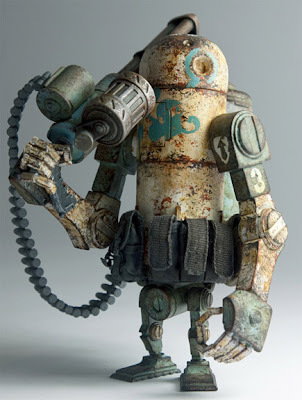 Initially, Bertie was released as a gigantic $300 figure. While extremely cool, this fell outside the price range of most collectors, inclucing myself. 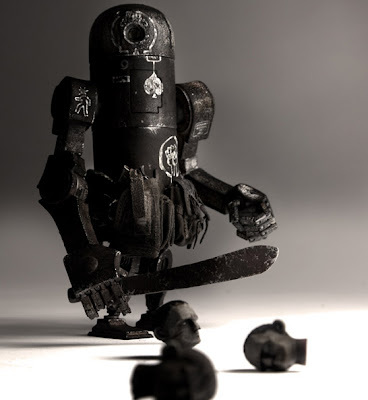 Thankfully, ThreeA developed a smaller 6.5 inch, $45 version dubbed the MK2, and Ashley Wood came up with at least 6 different variants which we will be receiving in January of 2010. Initially we ordered one case and the preorders sold out within 1 day, once word got out. So I just tripled our order and today all Bertie MK2 figures are available again! 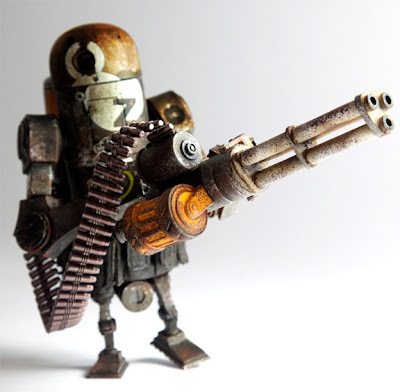 Preorders for these six awesome WWRP robot figures are available on Tenacious Toys right now! Arriving around the same time will be the 12" Tomorrow King Heavy figures and the NOM Commanders 2-pc set. Dec 5 UPDATE: Bertie preorders sold out! THANKS everyone! Dec 8 UPDATE: Ordered 2 more cartons, preorder while we still have em! coarse unveils their long anticipated 'false friends' series, a set of two original vinyl statues. The release incorporates key coarse characters 'paw! ', a monkey cross rabbit, and 'noop', a human like being, as they portray another episode in the ongoing coarse story. This time the dissimilar pair aspire to become companions - even at the price of their own identities. Demonstrating the underlying complexity of the brand, this series delivers yet another dimension to the world of coarse. The German artist duo behind coarse, once again showcase their distinctive aesthetic. Their forms are dominated by smooth curves, hard lines and sharp edges, combined to point of a unity. In past years, coarse has become renowned for its definitive style, its meticulous attention to detail and the vivid dreamscapes painted by its story line. 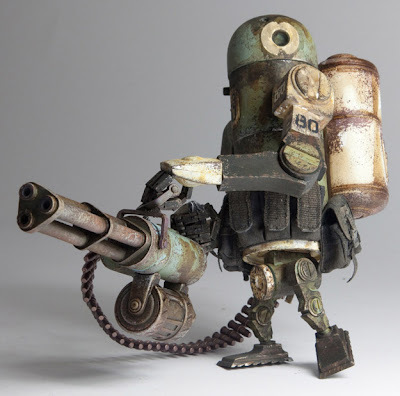 Recent coarse releases have almost always sold out instantaneously, and the scope of the latest offering proves why the brand has such an increasing worldwide presence amongst art toy and fine arts collectors. In this chapter of the coarse narrative, the young noop begins to mimic the appearance of his natural enemy, paw!, a tactic to secure his own survival. However, after being acknowledged as a paw!, the noop becomes trapped behind this mask forever. A dangerous and fragile friendship takes its course. This rare edition includes 'the colossal paw! and a freshly hatched noop, robed in his heavenly soft paw! suit.' The 13'' vinyl pair comes in glowing spring colors, put to sleep between two cotton pillows, every one embroidered with the individual running number. Safely packed in a hand crafted wooden box with a monkey rabbit nose handle and enclosed with a rubberband. Available only at coarsehkg and selected stores (tba). Possibly Tenacious Toys? Let us know if you want us to get some of these. [presale will be open for 24 hours – shipping January 4]. Bring home your new friends and never be alone again. Works for the coarse world began in 2003, when German artists Mark Landwehr and Sven Waschk started a distinct style of sculpting that looked almost as if they had chiseled and exposed the figures from three dimensional stone. The streamlined sculptures are hand crafted and finished at the coarse workshops in Hamburg and Hong Kong. The artists focus primarily on statues, that range from small to life size, made from resin and/or fiberglass. Their work also includes photography, prints and objects, combining all aspects to create holistic pieces of art. Pieces that convey an alternate reality. A fiction brand. 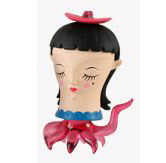 By using traditional toy production techniques, the original art objects, 'coarse originals', are transformed into vinyl figures under the 'coarsetoys' imprint. Living in two separate cultures, the artists blend eastern and western aesthetics, a possible explanation for the brand's popularity worldwide. 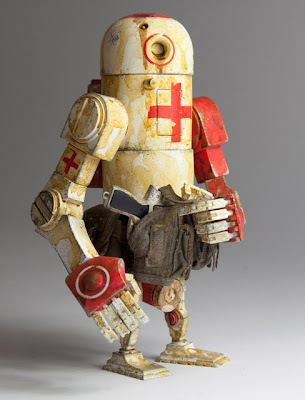 coarse figures are currently available in art toy stores and galleries across 18 countries worldwide. After several successful solo exhibitions in recent years, coarse goes on to display new and original works in Paris and Chicago in 2010. Heeey! It's Cyber Swamp Monday at Tenacious Toys! 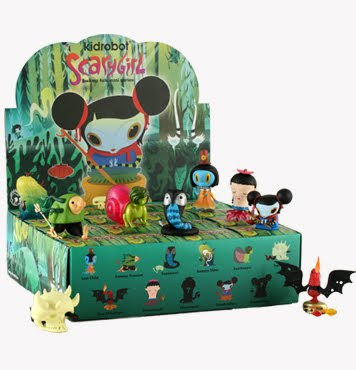 Place any order totaling $20 or more and we will throw in a FREE Kidrobot x Nathan Jurevicius ScaryGirl Swamp Folk open-box mini figure! While supplies last, and it's today only (Monday November 30th, 2009).